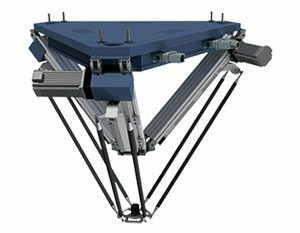 SYNCRO 600 Plus represents the overcoming of the new dimensional limit in high speed handling; the extensive work area places this robot on the operational level that few competitors are able to reach. 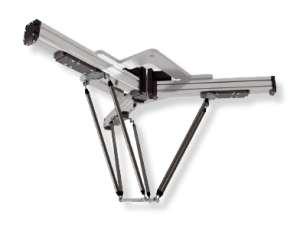 Its particular tetrahedral geometry with inclined axes allows fluid and precise movements, following paths that were inaccessible to Delta robots until a few years ago. The particular attention to the construction and the over-dimensioning of the carbon fiber arms permits a fast and a reliable cycle, even when handling significative loads. The 2” polyurethane toothed belt movement axes are developed from the Dierre standard versions and they are coupled with servomotors without other stages. The reduced maintenance and long duration of the mechanical components have been objects of research and result for this robot family. 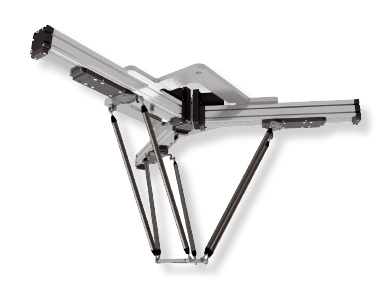 The management of the movement is carried out, as always, by CoordinAx motion system by Dierre Robotics, which remains unbeatable for its ease in the programming and its precision in the use.